Another story of older technology getting replaced by a newer and web-centric device. It's not just desktops, landlines, and physical media that are being replaced by web-centric devices. Even the television, among other entertainment paraphernalia found on airplanes, is not safe from newer technologies. The airline industry, one of the older firms that remain an important part of people's daily lives, is looking to cut costs and embrace newer technology at the same time. 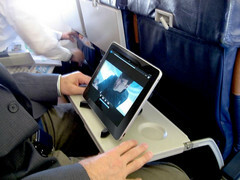 Scoot, a subsidiary of Singapore Airlines, has replaced entertainment systems with iPads on its airplanes. The decision was inspired by research to save fuel, money for Scoot's customers, and increase customer satisfaction. A Boeing 777-200 has 32 business class seats - at the moment, the only seats that are offered iPads during the flight. A New iPad Wi-Fi model weighs 1.44 lbs. All the iPads would only weigh 46.08 lbs. Even if all passengers were to each have an iPad including economy seats for a total of 361 seats, the iPads would weigh an estimated 520 lbs. in total. According Bloomberg, an entire entertainment system weighs more than 2 tons per Boeing 777-200 plane. Each plane potentially saves around 75% weight by substituting its entire entertainment system with tablets. This strategy also changes the way plane passengers consume media or pass time during a flight. A tablet not only opens more media sources than an entertainment system, but also allows some productivity thanks to the wide selection of apps found on tablets.